All skaters must have properly fitted and sharpened skates. No skate rentals available. CSA approved Hockey helmets are mandatory for all Canskate and Pre-CanSkate Programs. All skaters must have properly fitted and sharpened skates. No skate rentals available. CSA approved Hockey helmets are mandatory for all CanSkate and Pre-CanSkate Programs. Parents/guardians are requested to remain at the rink during sessions to assist their children if needed. • Pre-CanSkate - 2 ½ - 4 ½ years old. • Our annual Christmas Exhibition and family fun skate will be held 3rd week of December. • The week before the Christmas Exhibition we will be practicing group numbers for all skaters. They will be in the show. • Halloween will be celebrated during our CanSkate the week of Halloween. All skaters are encouraged to wear their costumes. • Amateur coaches on the ice are to assist homeclub coaches. They are volunteers and are not in-charge of a session. All skaters must have properly fitted and sharpened skates. No skate rentals available. CSA approved Hockey helmets are mandatory. 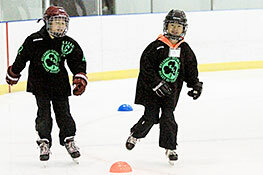 Hockey development is an instructional power skating program tailored towards hockey and ringette skaters. Coaches are all CanPowerSkate certified and lessons are taught in a group setting of approximately 1 coach per 10 skaters. The program works on developing proper skating technique by focusing on progressions for fundamental skills. An emphasis is placed on executing skating skills with balance and control. Skaters entering the program should have strong forwards and backwards skating skills in order to fully benefit from this program - we recommend level 5-6 in our CanSkate program. At the end of the term skaters are tested on a course where they are given a mark of bronze, silver, or gold. Their mark is dependent on the quality of the skill executed combined with the total time it takes to complete the set course. Participation in this program is by JEA Coordinator approval. By audition or assessment only. NO SKATE RENTALS - All skaters require their own skates. Junior Enrichment Academy (JEA) is for the figure skater who is interested in developing figure skating skills. 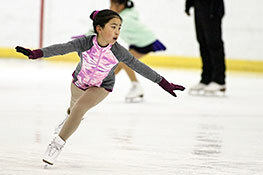 This program introduces figure skating basics and skaters will learn the essential skating skills: how to jump, spin, stroke, do footwork and perform. 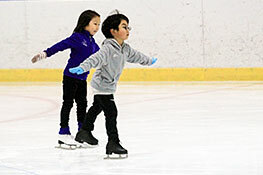 Skaters must demonstrate competent skating ability and be 9 and under. Classes include 1 hr on ice instruction and 1/2 hour off-ice enrichment class. This program runs 2 days/week. Participation in this program is by audition and assessment by the program coordinator. Please contact us at 604-430-2330 or killarneyskatingclub@gmail.com to learn more. NO SKATE RENTALS - All skaters require their own skates. This program requires the skater to skate 2 times per week and participate in off-ice. Participation in this program is by recommendation of Club Coach. Is an introduction to figure skating aimed at the recreational skater who is 9-13 years of age. Participation in this program is by recommendation of club coach.